In an earlier blog post, we talked about the secondary research value of aerial photographs. Secondary value is research that can be done in records that is different from the purposes for which the records were originally created. 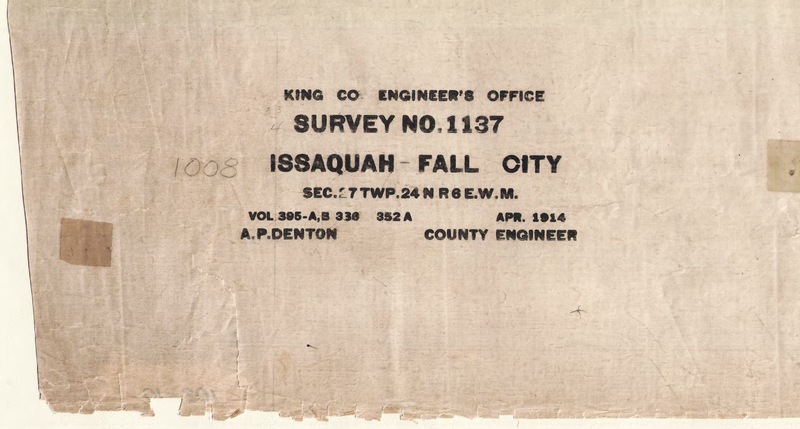 In addition to aerial photographs, another good source of secondary research value are the historical records of the King County Road Services Division. These records were originally created to document road construction or maintenance, but can also provide a wealth of information about historical structures, property ownership, or geographic or environmental conditions. Tracking the development of the built environment. This post will examine how to locate evidence about an ancestor in road project records and what these records can show. Road surveys and road establishment files (also called Road History Packets) can be rich sources of land ownership information, if your ancestor owned land in a part of King County which was unincorporated at the time and if county forces did construction or maintenance work nearby. Part of determining the route of the road required documenting who owned property along the route and thus would be affected by construction – how access and travel would be improved or hindered, what right-of-way would need to be acquired, or what structures or other property might be taken down or relocate to accommodate the road. In this survey, just south of Fall City and a cemetery owned by the International Order of Odd Fellows, is the property of William Wallace Pulver. Censuses and vital records indicate that Pulver was born in May 1839 to Harvey and Providence (or Prudence) Pulver, probably in Ontario, Canada. Sometime in the 1890s, he moved to western Washington, and began to purchase land in and around Fall City. In the detail below, the alignment of the road runs right through this part of Pulver’s land, where he had apple trees, a water closet, patches of raspberries and currants, and fencing around his property. This survey map also points to a book of survey field notes, discovered in the notation next to the intersection between the right-of-way and Pulver’s fence: “Fence Post Vol. 352 ‘A’ pg. 13.” That survey field book is also in the Map Vault and provides more detailed notes about the survey around Pulver’s garden. Knowing that William Pulver had a flushing toilet, a garden, and potentially an orchard not only gives us a glimpse of life in the early years of the county, but sheds light on Pulver’s occupation and economic status. That’s great, but how do I find my ancestors in these records anyway? In the 1800s and early 1900s, King County roads requested by citizens were initially named after the main petitioner. Thus, Seattle founding father David Swinson “Doc” Maynard shows up in the Map Vault as a petitioner of at least two roads and can be searched for by entering his last name into the “Project/map name” field. Clicking the link for the second result to download the Road History Packet for D. S. Maynard Road No. 2 provides not only Maynard’s original signature but also the reports to the King County Commissioners, written by Maynard himself as foreman of the crew surveying the route. This search by surname only works for the main petitioner – in this case, David “Doc” Maynard. Often the property owner petitioning for the road would recruit his or her neighbors to support the petition; these additional signatories are not indexed, unfortunately. However, this means that searching by the name of a known neighbor may yield documents that also mention the ancestor. Look in late 19th- or early 20th-century censuses for the people that lived nearby and search by their surnames as well. The Map Vault is also searchable by location (section, township, and range) or by road name, so determining the location of an ancestor’s land through other records may also provide information that can be used to search the Vault. The King County Road Services Division Map Vault is located at http://www.kingcounty.gov/mapvault, and the Road Services Division Map and Records Center can answer questions about how to use the Map Vault (email them at map.roads@kingcounty.gov). The original road history packets and many other historical roads records have been transferred to the King County Archives. Contact us at archives@kingcounty.gov.